And the 1940s was certainly an important time in the literary history of Ajijic. The author duo writing as Dane Chandos had just published Village in the Sun, while Neill James’s book Dust on my Heart, which also includes an interesting account of life in the village, was just about to be published in New York. Parmenter’s travel account, published in Stages in a Journey, coincided with a time when more and more Americans (and to a lesser extent other foreigners) were traveling south to explore Mexico. Parmenter, though, was not your average tourist. He had an artist’s eye but remained anxious about the difficulties and rewards of observing things in great detail. He was also an experienced writer. This somewhat unlikely combination gave Parmenter not only keen powers of observation but also an almost-obsessive attention to recording as many pertinent details as possible. Even if the detailed accounts of his trip were not enough, Parmenter is one of the relatively small number of Canadians who have ever written about the area, quite possibly the first of any note. Charles Ross Parmenter was born on 30 May 1912 in Toronto, Canada. At the University of Toronto he majored in modern history and reviewed art for the undergraduate newspaper. After gaining his BA degree in 1933 he worked briefly for the Toronto Evening Telegram before moving to New York in 1934 to work as a general reporter on the New York Times. In 1940 he joined the New York Times‘ music department as a reviewer, and was appointed the paper’s music news editor in 1955, a position he held until his retirement in 1964. This lengthy career at the New York Times was punctuated by the second world war, during which Parmenter served for three years as a medical technician. Discharge from the armed services did not immediately alleviate his troubled soul and he set off to Mexico, hoping to find his bearings. His traveling companion on this first trip – Miss Thyrza Cohen (“T”), a spirited, retired school teacher – was more than twice his age. The two friends drove down from California in “Aggie”, her 1932 Plymouth four-door sedan. Parmenter later wrote that whereas he had gone to learn about Mexico, he had actually learned from Mexico, a sentiment subsequently echoed by many other authors and artists. 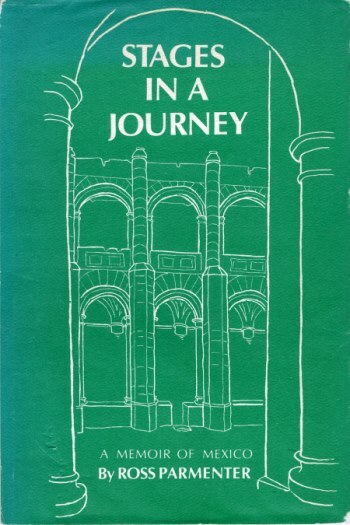 Parmenter’s Chapala-Ajijic trips comprise chapter 3 of his Stages in a Journey, which was not published until 1983. 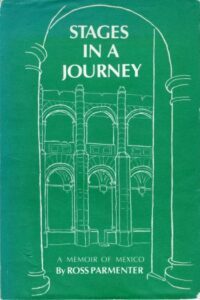 Stages in a Journey is an unusual book, part travel writing, part travelogue and part “an account of personal growth”, but still well worth reading. Parmenter loved Mexico. After he retired in 1964, he divided his time between New York and Oaxaca. 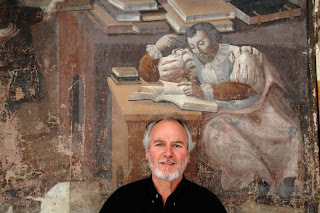 Over the years, he published several books related to Mexico and to his specialist interests in archaeology, Mixtec documents and colonial architecture. For Lake Chapalaphiles, the most interesting of other Parmenter books about Mexico is Lawrence in Oaxaca: A Quest for the Novelist in Mexico (1984), in which he looks in minute detail at D. H. Lawrence’s stay in Oaxaca over the winter of 1924-25. It was a productive stay, during which Lawrence wrote four of the pieces in Mornings in Mexico and rewrote The Plumed Serpent which he had drafted in Chapala the year before. Other books written by Parmenter include The Plant in my window (1949); Week in Yanhuitlan (1964); Explorer, Linguist and Ethnologist (1966) [Alphonse Louis Pinart]; The Awakened Eye (1968); School of the Soldier (1980); Lienzo of Tulancingo, Oaxaca (1993); and A House for Buddha: A Memoir with Drawings (1994). Parmenter fans will be disappointed to learn that another work – Zelia Nuttall and the recovery of Mexico’s past – remained unpublished at the time of his death, though copies of the manuscript are held by Harvard University and the University of California, Berkeley. Ross Parmenter died at his Manhattan home on 18 October 1999 at the age of 87. William H. Honanoct. 1999. “Ross Parmenter, 88, Music Critic And Author of Books on Mexico“. New York Times, 22 October 1999. Ross Parmenter. 1983. Stages in a Journey. New York: Profile Press. Ross Parmenter. 1984. Lawrence in Oaxaca: A Quest for the Novelist in Mexico. Salt Lake City: G. M. Smith/Peregrine Smith.